Heels have been my shoe obsession for years, however since becoming a mum, I have had to put my babies on the shelf for the most part, and give in to the fact that they are not the most practical shoe to be chasing after a toddler and going to the park in (insert crying emoji here!). So I have slowly started building my flats collection, and my latest pair are these classic brogues. 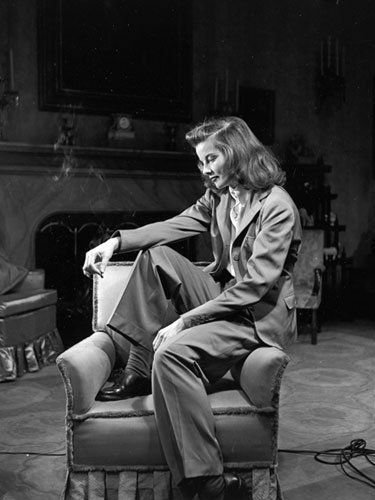 Brogues immediately bring to my mind images of ultimate tomboy style icon, Katherine Hepburn. Styling hers with wide leg pants, a simple blouse and jacket thrown over top, this lady knew how to pull off masculine tailoring with an effortless vibe that is still of so chic. And while this look would be totally acceptable to wear down today's streets, how about juxtaposing their masculine edge with a floaty dress that is usually the epitome of a girly wardrobe. Or, like I have above, throw on a pair of cropped trousers, a white tee (or button down) and a classic black blazer that could just as easily take you out to brunch as it could to the office. How would you style brogues?